I think my days of driving coupes are coming to an end. That’s especially so as Sam’s arthritis begins to outpace my flexibility and even with ramp, towels, pillows and lots of bridge-building between seats, it’s difficult to get him into the back of low-slung, two-door cars. It’s a pity as there’s no doubt what a good-looking premium coupe does for the image of a white-haired man on the pudgy side who is living – for a week at least – a life on wheels that wouldn’t normally be obtained. I felt this as I was coming back through Dublin’s Grand Canal Dock area last Sunday after our trip into the Dublin Mountains. I saw my ever-glamorous colleague Niamh Horan waiting to cross the road. I hooted and she gave an energetic wave but I know it was for the car – she probably couldn’t even see that I was driving. If she knew there was an old dog on board, she’d have been even more effusive! Anyway, to have a young blonde wave proves my point. I was driving the coupe version of the massively impressive Mercedes-Benz E-Class saloon, which swept most of the opposition before it in terms of awards last year. The E-Class saloon remains the class leader in its field and is rightly the reigning Sunday Independent Car of the Year. And there’s no doubt the coupe carries over all that class and then adds some brio. My partner could see I was enjoying driving the car and it handled as good as it looked, although it isn’t quite as assured as the saloon – but you’d expect that from a coupe. It didn’t drive quite as well as it looked dressed in its Polar White suit with two-tone Nappa leather in red and black undergarments (€1,035 extra) and “open-pore” Black Ash wood trim (€613 extra). It had a brilliant interior which appealed to the plutocrat in me with all the right touches. The double dashboard was real class with great graphics. But, and it’s a big but, overall the E220d AMG Automatic wasn’t cheap and a whole raft of extras, including the ones already mentioned, increased the basic €53,690 to €72,057 on the test car… And there’s a number of other models in the range that will take the price into the stratosphere. The 1950cc, 194bhp engine is far quieter than its predecessor and while I’m going off diesels fast it’s very economical (61.4mpg) and does the 0-100kmh dash in 7.4 seconds. 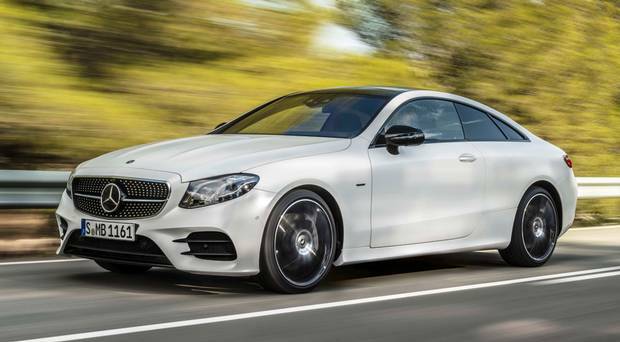 There’s now a 50-year tradition behind coupes like the E-Class but this one is the most comfortable and could be destined to be a classic. It’s longer, wider and has a lot more legroom in the back if you are supple enough to get there. You shouldn’t be too tall either or your head will be scraping off the roof, especially if the sliding panoramic one is in place. There are masses of safety and parking gizmos on board which eventually aim to get rid of the driver completely. There was a nice line in the original press release about the E-Class coupe which said the “new LED tail light arrangement employs innovative crystal optics to give off a brilliant appearance that Mercedes-Benz says is reminiscent of a jet engine glow”. Maybe so – as Mercedes takes off with a fair chunk of your money but then there is just the possibility you may have a young blonde on board. You’ve got to take it when you can.